Vallibel Finance--pre-tax profits which propelled to Rs. 934 million, a growth of 47%. Sri Lanka Equity Forum » Stock Market Talk » Vallibel Finance--pre-tax profits which propelled to Rs. 934 million, a growth of 47%. Vallibel Finance, the name-bearer of the iconic Vallibel Group, capped yet another outstanding Q3, reporting impressive returns for the last nine months of 2016. Total income crossed the Rs.3 billion milestone, reaching Rs. 3.6 billion, netting in an exponential growth of 43% as against the previous figure of Rs. 2.4 billion.It was a robust nine months for the company as all key indicators returned trumps. Net interest income moved up 18.9% percent to reach Rs. 1.44 billion, bolstering the pre-tax profits which propelled to Rs. 934 million, a growth of 47%. The company stamped its stature on the loan book as well, disbursing Rs. 13.1 billion during the same period of 2016, offering renewed impetus for growth for people across the country, as a far-fledged mandate of financial support took deeper roots reaching more people in more places. This was evident in the loan book as total disbursements reached Rs. 23.7 billion. Non-performing loans declined to 3.15% (gross), 0.45% (net), offering a strong testimony to prudent financial stewardship. “Ours is a home-grown model of financial stewardship that makes us an integral part of the lives and dreams of our customers. At the same time, it’s all built on professionalism and accountability,” said Vallibel FinanceExecutive DirectorDhammika Perera. The increasing popularity of Vallibel Finance and the respect it commands in the market are evident in its performance which is clearly indicative of the increasing stature of the company.Vallibel Finance consolidated its standing as a leading light in the competitive financial sphere and its third quarter report card affirms the company’s ability to sustain its ascendency, year after year,continuously showing impressive performances during a very challenging period. Deposits complimented the lending portfolio, growing exponentially by over Rs. 3.5 bor 25% by the end of the financial period under review over the previous year with total deposits amassing to Rs. 17.3 b, firmly entrenching public confidence in the company. Total assets continued its upward curve growing by 30% to Rs. 29.6 b over the previous year’s figure. An ambitious financial mandate was built on the premise that winning the hearts and minds of everyone will ensure their own success stories. “Every step we’ve taken, we’ve managed to move forward and grow as a company. As a financial organisation, Q3 has shown our strengths in a much bigger light than ever before. 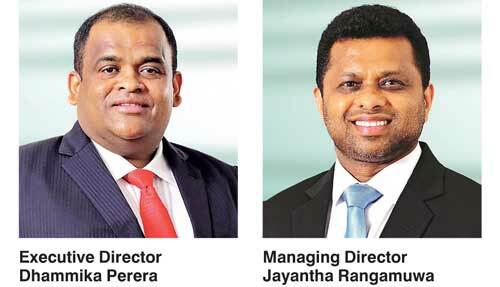 It’s truly been a remarkable journey,” Vallibel Finance Managing Director Jayantha Rangamuwa.